I am a storytelling and comedy nerd, a marketer, and a comic improviser. I know how important preparing and letting go is. In the same way software nerds rule technology development (I say this with admiration, as I am married to one! ), the future of streaming video success belongs to leaders that embrace conversation, being human, and letting go. That means being willing to experiment and improvise as needed. Brand control is an illusion. Brands that embrace preparation, trust, empower others, and then playfully ditch “the script” as needed will inherit the video streaming earth. 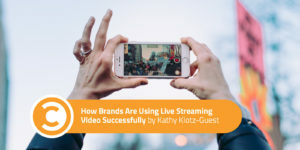 What streaming video does best is allow brands to drop the corporate veil, connect human-to-human, and allow users to participate in brand storytelling in ways that enrich the customer experience. So how are companies using streaming video today successfully? New ways to use streaming are popping up all the time. Here are a few of the most popular applications to date. Experian uses live video for chatting about credit, debt, student loans, and ways to manage and improve your scores, using the hashtag #creditchat. AWeber has been holding office hours to answer user questions. Nissan streamed the launch of its 2016 Maxima at the New York auto show. Frito Lay’s Doritos used it in combination with other platforms to support the launch of the Doritos Roulette product. At the Consumer Electronics Show, General Motors became the first auto brand to livestream on Facebook when it rolled out the Chevy Volt EV. Nestlé’s Drumstick did a sponsored event to reach out to early Periscope influencers to create their own content and promote with sponsored tweets. SAP teamed up with key social influencer Brian Fanzo and others for 25 hours of Blabs over five days leading up to the Super Bowl (February 1–5). Each day a new SAP partner was the focus. SAP was in the background, telling its story through the lens of its partners, according to Fanzo. These live events have included presentations, talks, conferences, press conferences, performances, concerts, tours, and demos. GE used drones equipped with Periscope to give guided tours through remote facilities as a part of #Droneweek. Taco Bell used it to hold a fun mock press conference. Red Bull and Mountain Dew have also used it for events. U2 and Spotify have used it to stream live musical performances, including a Dunkin Donuts summer music effort across seven platforms, including Periscope and Spotify. The Madden video games series had their marketing team use live video to get behind-the-scenes coverage of players and share it with fans. The Tonight Show used Facebook Live to show behind-the-scenes footage of the show. Target has used it to give fans sneak peeks of its design partnerships and promote fashion week. DKNY has also used it for similar behind-the-scenes glimpses, and Marc Jacobs used it to preview its 2016 line. Streaming is not about produced video, and it’s not the place for polished webinars. Brands are afraid of being imperfect. Ask your followers questions, listen, and then have them talk to you. People want to see who you really are. There is currency in that very real, human, two-way exchange. There will always be a market for produced, polished brand videos. People have questions, and they don’t want to wait until your video teams have produced the heck out of something so much that it feels overdue and over-scripted. 2. Be willing to take some risks and trust others. The investment in people and ideas is more important than the technology, so invest in and empower your best internal and external brand ambassadors and storytellers. Fanzo says the top brand using live streaming today is Ultimate Fighting Championship (UFC). It features ten-minute Q&A sessions with ring girls before matches and uses streaming for behind the scenes weigh-ins. The key to its huge success is that the CEO of UFC is willing to collaborate with others and try lots of new things. You don’t have to do it alone—invite others to help expand the reach of your brand into their networks. That requires trusting people. 3. Let your audience know you care. “That connection makes your audience believe you,” says Fanzo. Additionally, a big part of the beauty with live-streaming engagement is discovering what people want and using that to sharpen content marketing strategy. Brands that are listening can then design content around questions raised during the streams. 4. Demonstrate business value for your audiences and biggest fans. Use streaming to create conversations, give customers important information, and highlight fans, partners, employees, and new technologies (and share the spotlight). Sharing behind-the-scenes glimpses is yet another way to thank your biggest fans and enable them to help share your brand story. When done well, these approaches have generated returns for brands in the areas of publicity, engagement, downloads, lead generation, and influencer marketing. 5. When you let go, have fun! It’s also important to recognize that brands need to allow for spontaneity when the plan isn’t working and you need to ditch the script. Plan, adjust, let go, and have fun in the moment—that’s the real, human and conversational aspect of video. I’ve done several Blabs in the past eight months where my guests and I improvised marketing ideas live based on user suggestions. We had no idea how things would turn out, but we generated some viable ideas and had a lot of fun. Nothing is perfect. Your brand isn’t, and customers don’t expect that. What they want is human. While ultimately returns—short-run and longer-term—matter, part of live streaming video’s opportunity lies in allowing brands to try new things. Brands that have difficulty letting go will struggle. Fanzo says the most powerful phrase every brand can say on live streaming is, “I don’t know,” if something doesn’t work. Agile brands have a plan and know when to ditch it, just like a finely tuned improv team. Prepare, and then let go. I can’t think of a better, more human way to galvanize your champions, widen your reach, inform new content ideas, and find new ways to create valuable experiences that do not require a huge investment in technology or production.